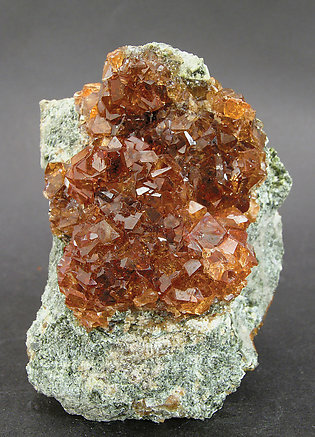 Aggregate of transparent dodecahedral crystals. They have a very intense and uniform green color and present fine striations of the surface of their faces. 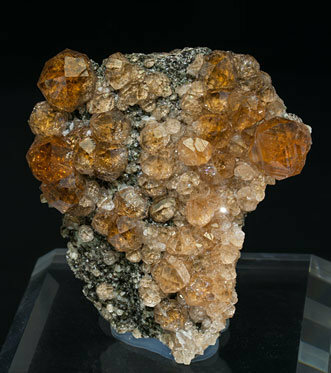 In contrast with the usual habit for this kind of sample, most of the crystals also show faces on the back of the piece. 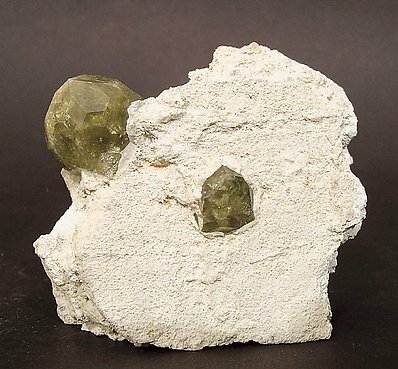 Dodecahedral crystals with very well defined faces and edges. 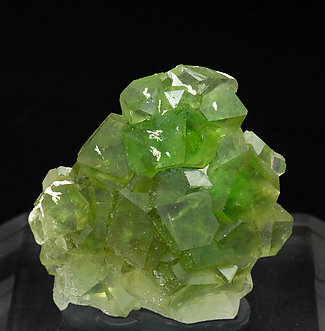 On matrix, they are transparent, very bright and have a very pale green color with deep green phantom growths. Green Grossular, and above all as intense a green as this one, is uncommon. As well as that the dodecahedral crystal is very well defined. Specimens from this locality are not that common anymore. A floater, a complete Grossular dodecahedron, beveled by trapezohedron faces. 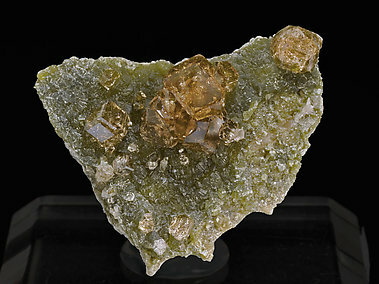 Crystal shows a very curious color zoning, creamy color and opaque on the edges and yellow to greenish and transparent in the center of the faces. A novelty, because this color zoning it was not seen before. 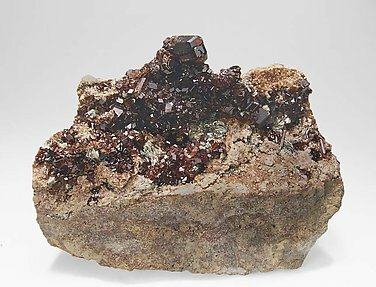 A group of dodecahedral crystals perfectly defined, with a good luster and a color quite different than usual for the Grossular from this locality. Extremely gemmy Grossular well displayed on its matrix. Great luster! An eudral Grossular from the Wilui river, an area that is famous for the Wiluite species but that also provides great Grossulars such as this one. The crystal is on matrix and has a dominant dodecahedral form modified by the trapezohedron. Luster and transparency are excellent, enhanced by a magnificent color, very intense. One of the sides is in contact wit the residual faces of another, now disappeared, crystal. 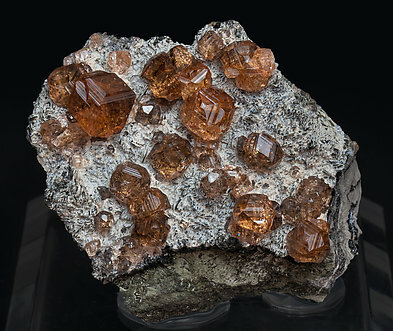 Crystals with polycrystalline growths, dominant dodecahedron faces beveled by the trapezohedron, of excellent color, a very intense luster and with small crystals of Clinochlore, on matrix. We note the locality, very unusual, especially for such good specimens. Group of dodecahedral crystals beveled by the faces of a trapezohedron. They have very well defined faces and edges and an excellent luster and color, between pink and orange. They are on a matrix coated by small crystals of Clinochlore. 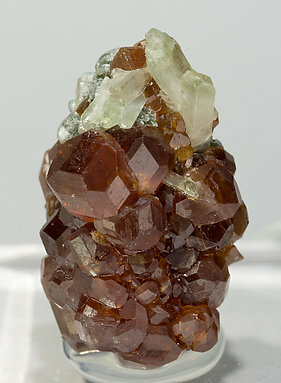 Elongated rhombohedral Hessonite crystals on an uncolored Clinozoisite crystal matrix. The piece is accompanied by a handwritten label with notes from Mr. Folch. 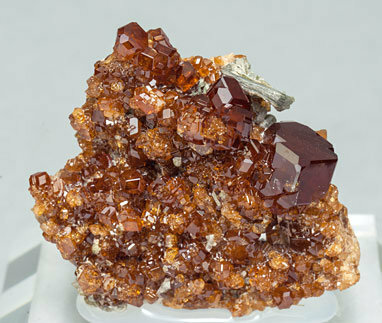 Group of crystals of Grossular (variety Hessonite) composed of the trapezohedron and the dodecahedron. 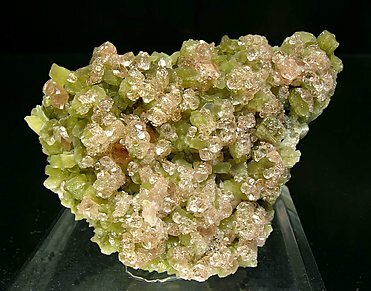 They are transparent and have a very deep color which contrasts with very well defined crystals of Diopside and small crystals of Chlorite. From the Tiziano Bonisoli collection (num. 6296), whose label we’ll send to the buyer. 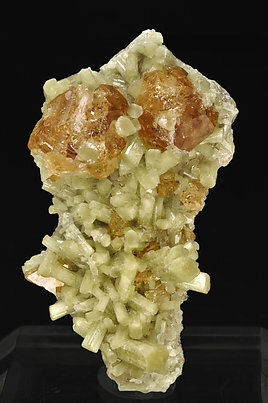 Very aerial group of very transparent crystals of good color on fine crystals of Vesuvianite and on matrix. 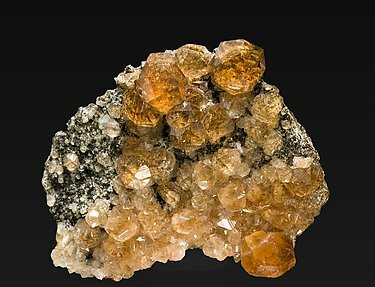 Very aerial aggregate, on matrix, of very transparent, bright and very well defined Grossular crystals, formed by the faces of the trapezohedron, finely striated and echeloned, and those of the dodecahedron. 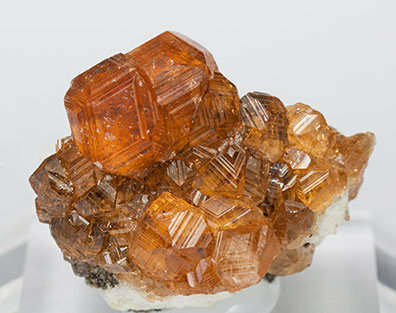 Aggregate of very transparent trapezohedral crystals with a very intense color. They are on matrix, are extraordinarily bright and have fine striations on their faces. 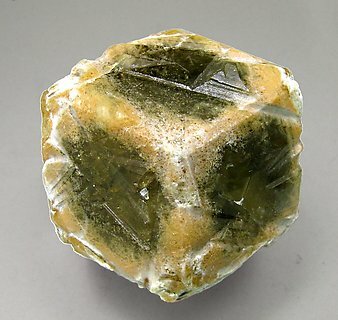 Druse, on matrix, of crystals showing a combination of trapezohedron, dodecahedron and cube faces. 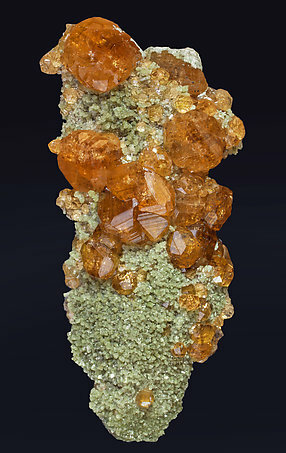 They are transparent, very bright, with a very vivid orange color and are partially coated by leafy aggregates of chlorite. Grossular crystals with the well balanced forms of the trapezohedron and the dodecahedron. They are translucent, very bright, and have a very intense deep color. On matrix with leafy chlorite aggregates. An Italian classic from the Carles Curto collection whose label and catalog card we will send to the buyer. 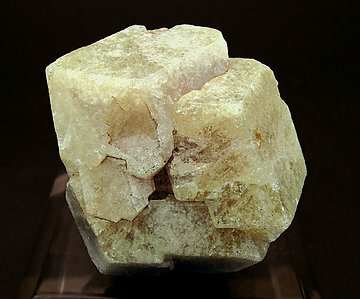 Single crystals, on matrix, with very well defined faces and edges formed by a dominant dodecahedron beveled by a trapezohedron with fine growth striations. They are extraordinarily transparent and luminous and have a deep and uniform honey color. A Canadian classic of great quality. 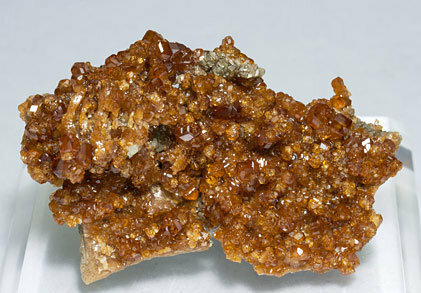 Aggregate of very sharp dodecahedral Grossular (hessonite variety) crystals, one of them clearly dominant, beveled by the trapezohedron. They are translucent, extraordinarily bright and are with leafy aggregates of Clinochlore. The sample has a very uncommon quality. 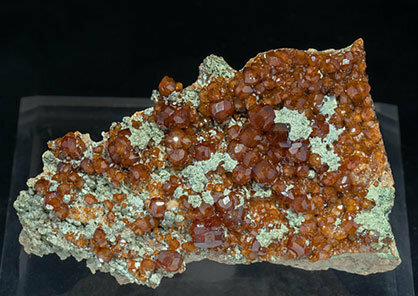 Aggregate of very sharp dodecahedral Grossular (hessonite variety) crystals beveled by the trapezohedron. They are translucent, extraordinarily bright and are with leafy aggregates of Clinochlore. The sample has a very uncommon quality. 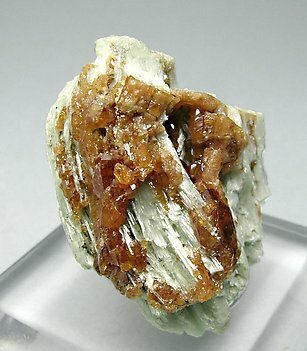 Trapezohedral crystals that have very well defined faces and edges, transparent, very bright and an excellent color. 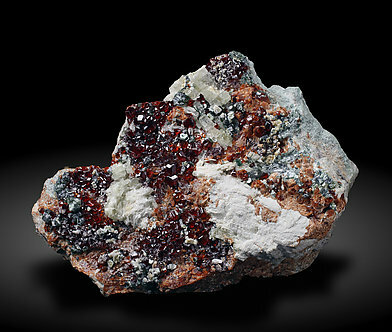 They are on matrix, with small crystals of Clinochlore. Thinking of Grossular localities it is very probable that the first in our mind will be Val d’Ala. 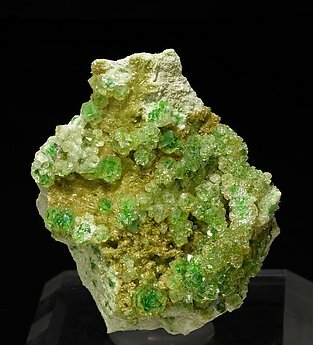 The crystals, very well defined and combining the forms of the dodecahedron and the trapezohedron, with splendid color and luster and the presence on the matrix of Diopside and Clinochlore crystals do this sample great credit as an Italian classic. 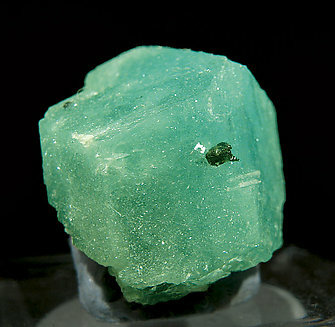 Group of well-developed crystals with a good size, trapezohedral with dodecahedral faces, transparent, very bright with an intense color and on a matrix coated by small Diopside crystals. Totally transparent dodecahedral crystals, with a delicate pinkish color and extraordinary brilliance. On a Diopside crystal matrix. 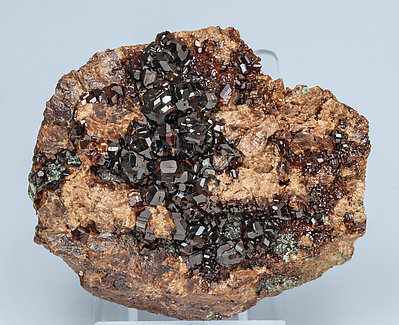 This specimen is from the private collection of the well-known Wendy and Frank Melanson from Canada. 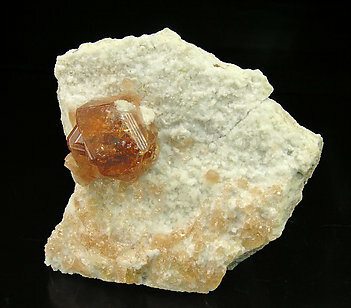 Two crystals, clearly dominant, formed by the faces of the dodecahedron and trapezohedron, bright and very well defined. 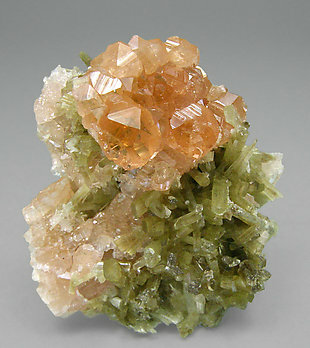 The matrix is a group of aerial and well defined prismatic crystals of Diopside.